The UK will take part in May's European elections and British MEPs could sit for "months or even longer", European Council President Donald Tusk has said. But Theresa May needs to get her withdrawal deal - which has been rejected three times by Parliament - approved by MPs. Cross-party talks between the government and the Labour Party are continuing this week to find a way through the impasse. On the European elections, Mr Corbyn said he was "very confident" that Labour would win support for its message that the UK needed a close economic relationship with the EU. "They (the UK) will have to decide what they want by October," he said. "You cannot drag out Brexit for a decade." 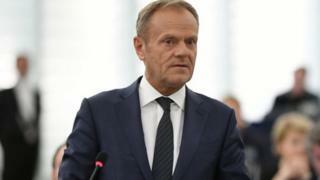 Speaking in the European Parliament in Strasbourg, Mr Tusk insisted that if British MEPs were elected in May, they should be treated as "full members". Image caption European Commission President Jean-Claude Juncker said Brexit was "not the future of the EU"
"One of the consequences of our decision is that the UK will hold European elections next month," he said. "We should approach this seriously as UK members of the European Parliament will be there for several months - maybe longer." "I have strongly opposed the idea that during this further extension the UK should be treated as a second category member state. No, it cannot," he said. He said the EU had not given into "fear and scaremongering" that the UK would act in an obstructive way, saying the UK had been a "responsible and constructive member state". BBC Brussels correspondent Adam Fleming said this was a "clear swipe" at French President Emmanuel Macron and others who had warned the UK could disrupt the functioning of the EU during a long extension. The extension of Article 50 - the process by which the UK leaves the EU - gave the UK time to cancel its departure if that was what the British people wanted, Mr Tusk said. He said he knew both sides of the Channel were "exhausted with Brexit" and this should not be "an excuse to say, 'Let's get it over with,' just because we are tired". "We must continue to deal with Brexit with an open mind and in a civilised manner," he said. European Commission President Jean-Claude Juncker reiterated that there would be no renegotiation of the withdrawal agreement. "Brexit is not the future of the EU," he said. "The future of the union will go well beyond Brexit." He urged the UK government and the Labour Party to reach a cross-party consensus in the "coming days". Works and Pensions Secretary Amber Rudd told BBC Radio 5 Live that "leaving the EU is harder than a lot of people thought it was going to be". She said the prime minister was right to request a Brexit delay and had "done the right thing in reaching out to Labour" for cross-party talks. "You can't just give up, you have to find a different approach," she said. 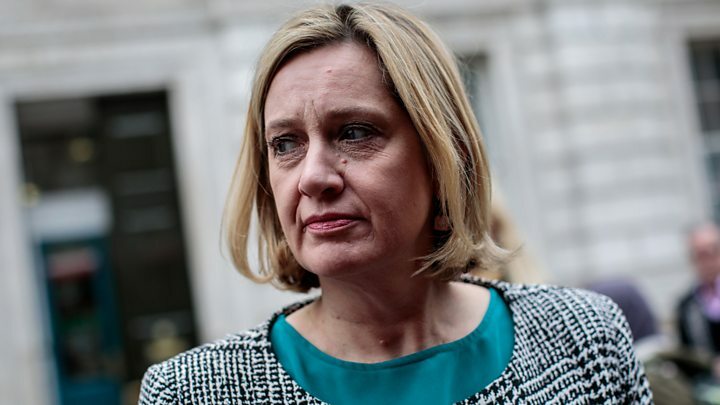 Amid speculation about Theresa May's future, Ms Rudd said it was "entirely possible" she could be a candidate in a future leadership election, telling BBC Radio 5 Live "I don't rule it out". Earlier in the interview, she said: "I'm not planning to run" but "I've kept the door slightly ajar."